The 30 new double-deckers feature WiFi, USB charging features and passenger tables and operate on several services across Cornwall. First Kernow has introduced a new £7.4m fleet of Alexander Dennis Ltd (ADL) Enviro400 MMC double-deckers. All 30 of the new vehicles feature free WiFi, USB charging points and tables. They have entered service the operator’s network in Cornwall, on the U1/U2/U3 (Falmouth, Penryn, Truro) and 14/18 (Penzance, St Ives, Hayle, Camborne, Redruth, Truro) services. The £7.4m investment represents the first stage of the bus operator’s long-term commitment to the region. The buses are fitted with Euro 6 engines and start-stop technology, which cuts the engine when a bus is stationary. Acting on feedback from passengers, the company also decided to remove the screen that separates the driver from passengers for a more personable service. Alex Carter, Managing Director of First Kernow, commented: “We are extremely proud to introduce these state-of-the-art brand-new buses into Cornwall. 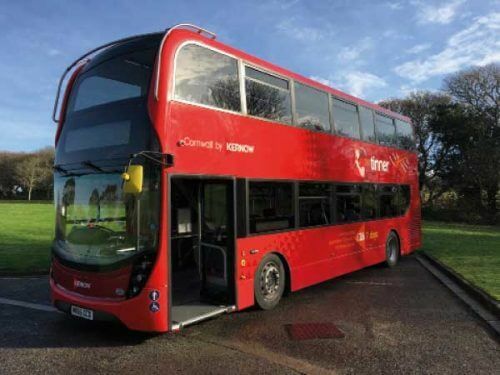 He added: “These buses are the first stage of a strong programme of fleet and infrastructure investment in public transport with our Cornwall Council partner.